I have been collecting music by women composers for solo oboe the last eight years and to date have over 70 pieces to choose from, many of the pieces specially written. This works well as a " short " concert of about 40-50 minutes and can also be supplemented to be presented as a full length recital. To date I have given performances of this show both in the UK and abroad including at the London New Wind Festival, Chard Festival of Women in Music, Kings College Conference for Women and Gender in Education, COMA Summer School, Bath Spa University, Women in Music Conference, Dartmouth College Music Department USA, University of Hong Kong, RHTK Radio, Hong Kong. 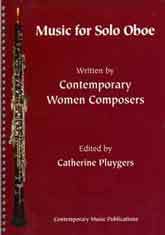 I have collated a book 'Music for Solo Oboe by Women Composers' featuring music by, Ruth Gipps, Morgan Gordon, Enid Luff, Elizabeth Lutyens, Helen Roes, Jane Serter, Ruth Sidwell, Roz Southey, Liz Williams and Julia Usher. This explores many different styles of writing and provides much needed new music for the concert platform. Available for £19.95.